We were provided with a meal to facilitate this conversation. Opinions are my own. A good burger is a beautiful thing. I'm not talking about a fast food burger when you're hungry. Nor am I talking about that frozen patty your brother-in-law cooks on his electric grill. 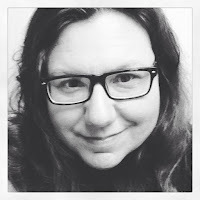 I'm talking the kind of burger you can still taste when you conjure up the memory. The kind of big, juicy patty with crisp lettuce on a bun toasted to perfection. Bacon is optional but usually is the missing ingredient. 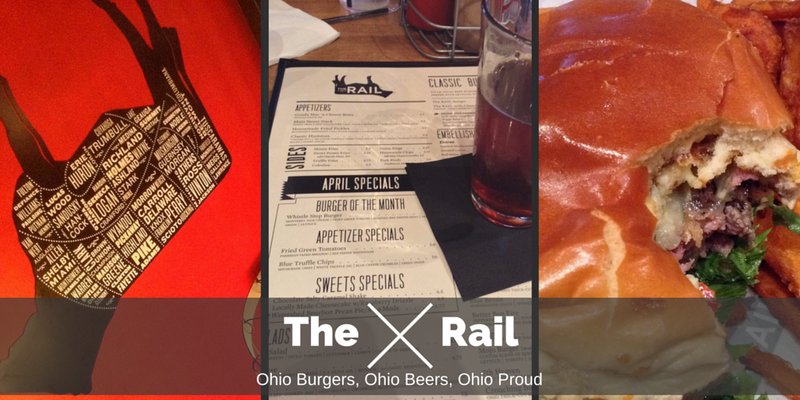 The Rail is THE restaurant in Northeast Ohio to go to when you are craving a perfect burger. The Hubs and I discovered The Rail when taking the kids to the movies two years ago. The smell was intoxicating. We would have stopped, but our kids don't eat red meat (their choice, not ours). Our next date night we went and it has been one of our go-to restaurants for date nights. We knew we could get great food and try new beers, but not a whole lot more. What else do you need to know? My perception of The Rail changed when I joined a couple of other Cleveland bloggers for dinner. The food is just as amazing. Now, I'm devoted to them for what they stand for, too. I love to talk to a chef who loves food. I mean a chef who l-o-v-e-s the food that he creates. Chef Mike Hawks is that kind of chef. As we sipped our beers and cocktails, Chef Mike talked about The Rail, Ohio beef, and Ohio beers. The Rail takes great pride that all beef is Ohio raised. And by Ohio raised, they mean the cows we pass grazing in Ohio’s farm country, local. It's not just the beef that is from Ohio. Pork shoulder and even a beef/buffalo hybrid dubbed 'Beefalo' are also in Ohio. All three locations search for new ways to keep it local, even for produce. Since Ohio can't grow most produce year-round, Mariola assures that when produce is available, it will be on the table. The Rail serves a hybrid lettuce called the Cleveland Crisp. Developed and grown by Green City Growers. Green City Growers is an urban greenhouse hydroponics facility. It was a dilapidated building before they moved in. Pickles and herbs like parsley, cilantro and basil are also from right here in the buckeye state. Orlando Bakery delivers fresh baked buns five days a week from Grand Ave, in Cleveland and many of the cheeses are from Great Lakes Cheeses. Starting with a few appetizers, our table tried blue truffle chips, housemade fried pickles, gouda mac n' cheese bites, and a grilled caesar salad. Blue truffle chips are wonderful house-made chips with white truffle oil, blue cheese crumbles,and green onion. The grilled romaine in the caesar salad had a nice smoky flavor and remained crisp. My favorite was the fried pickles. Dusted in dill flour, these pickles were full of flavor. The gouda mac n' cheese are better than you are imagining. I had this month's special burger, The Whistle Stop burger. As a fan of Fannie Flagg, I thought I should give it a try. It didn't disappoint. I wish they had it all year long. Monterey jack cheese and a fried green tomato on a beef burger with roasted red pepper mayo. The sweet potato fries with chipotle mayo complimented the burger perfectly. The hubs had the Crouching Tiger, Hidden Bacon burger. Made with Ohio thick-cut bacon, pork shoulder, crispy wonton, and Rail sauce. He added cheddar cheese and a fried egg to make it his perfect burger. What happens when a Cleveland pie maker catches the taste buds of The Rail? She quits peddling her pies at local farmer markets. Instead, her hobby became a full-time job baking for all three locations. Her pies are delicious with a capital D.
The hubs had her cheesecake with raspberry drizzle. He, reluctantly, let me try it. This cheesecake is so rich, thick, and creamy. It was ideal. I had a slice of the Watershed bourbon pecan pie but skipped the Smith's ice cream. One bite and I could have cried. This pie was full of bourbony (that's a word now), nutty goodness. My mouth was so happy. I had it with black coffee. I swear I drank the coffee but it seemed I never had an empty cup. Watershed and Smith's are both made in Ohio, too. Ohio breweries are always featured and lead the discussions. April's meetings will feature Catawba Island Brewing, Platform Brewing, and Canton Brewing. Dates for each of the location plus the lineup of beers and breweries are on The Rail's website. The Hubs and I each had the Catawba Island Lake Erie Love Kölsch. I enjoyed this Scottish beer. 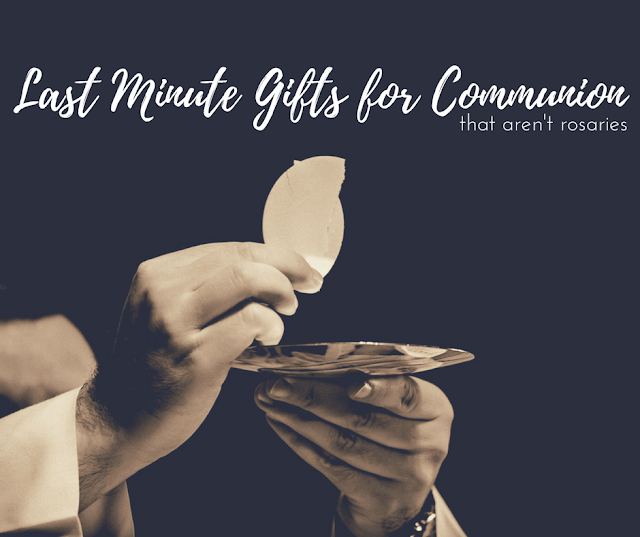 It's rich and sweet, but not overly sweet. Wanting to try a new beer, I got Jackie O’s Mystic Mama IPA. Not a fan. I could not get past the smell of grapefruit to enjoy this citrus beer. Finally, The Rail is not just about burgers and beer. In its fifth year, The Rail will host Rail Against Breast Cancer Sunday, May 1, 2016, from 5:30 - 8:30 PM. 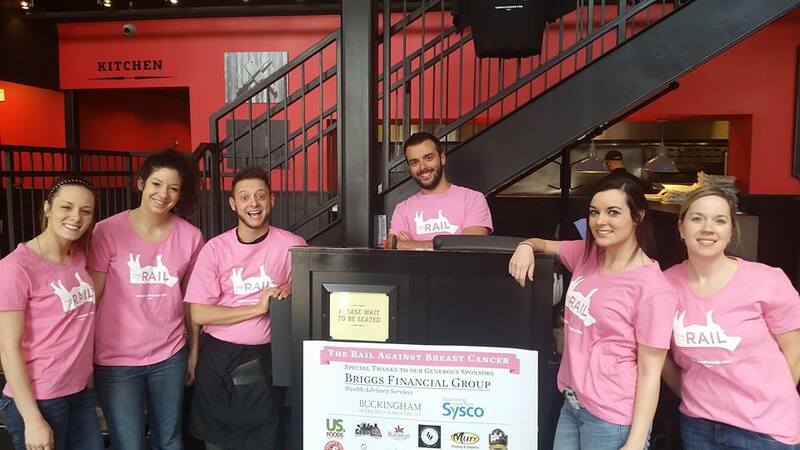 The benefit will raise money for Team Breast Man Walking. Akron natives, Kathy and Lee Giller and Nancy Schrader, are Team Breast Man Walking. They will take part in the Susan G. Komen 3-Day in Cleveland. Lee, who is celebrating 11 years of remission, is the inspiration behind their team name. The Rail is adding one more location in Strongsville! Ah-maze-ing burgers, beers, and a social conscious - no wonder they are growing!